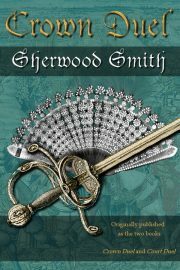 1997’s young adult fantasy Crown Duel is the first novel in Sherwood Smith’s Crown Duel series. It was followed by 1998’s Court Duel. Both are included in this omnibus. Together, they are part of the larger Sartorias-deles sequence. Two young aristocrats, Meliara and her brother Bran, learn that King Galdran is planning to break the Covenant with the Hill Folk; he wants to clear-cut the valuable colour trees of Tlanth, Meliara and Bran’s domain. The two feel that they must protect the trees, and the Covenant, and the only way to do so seems to be mounting a rebellion against their liege lord. Conveniently, the siblings have been plotting an uprising for some time; Galdran is an all-round bad king and he is comprehensively hated. Their rebellion is not going well. Potential allies have refused to help; their mercenary army has already betrayed them. 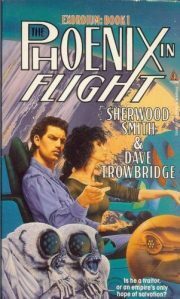 1993’s The Phoenix in Flight is the first volume in Sherwood Smith and Dave Trowbridge’s Exordium pentology. There is a new edition of this volume, but this review is of the 1993 edition, because that is the edition I happen to have on hand. Eusabian, Lord of Vengeance, avatar of Dol, grumpiest Dol’jharian of all, has long yearned to punish the Panarchy for defeating Dol’jhar some decades ago. The main problem facing Eusabian is that the Panarchy draws on the resources of the many races and worlds of the Thousand Stars1; Dol’jhar draws on the resources of … Dol’jhar, a cold, bleak, poor planet. But now Eusabian has learned how to exploit the still-functioning relics of the long-vanished Ur. With the Ur’s instant communications and their stupendous power sources in his possession, the balance of power has tilted decisively in Eusabian’s favour. The time has come for his vendetta, his ritual paliach. Which in its purest form ends with the display of the severed head of the enemy.